The Cthulhu Mythos, also known as the Lovecraft Mythos, is a shared fictional universe created in the 1920s by American horror writer Howard Phillips Lovecraft. The term was coined by Lovecraft's associate August Derleth, and named after Cthulhu, a powerful fictional entity in Lovecraft's stories. It refers to a loose framework formed by common elements (such as places, names, or entities) that appear in more than one tale, adding continuity and depth to the works. — Excerpted from Cthulhu Mythos on Wikipedia, the free encyclopedia. The Lovecraft Mythos is the term coined by the scholar S. T. Joshi to describe the imaginary mythical backdrop, settings, and themes employed by the American weird fiction writer H. P. Lovecraft. Lovecraft's mythos is the foundation of a fictional myth-cycle known as the "Cthulhu Mythos", first recognized and developed by the writer August Derleth, that places a particular group of Lovecraft's stories into a separate and distinct category. — Excerpted from The Lovecraft Mythos on Wikipedia, the free encyclopedia. Lovecraft borrowed terms and ideas from earlier writers he admired: Hastur, for example, was originally a benevolent deity mentioned in an Ambrose Bierce story, but took on more sinister traits when appropriated a few years later by Robert W. Chambers. Lovecraft's only references to Hastur are in "The Whisperer in Darkness".— Excerpted from Cthulhu Mythos on Wikipedia, the free encyclopedia. During the latter part of Lovecraft's life, there was much borrowing of story elements among the authors of the "Lovecraft Circle", and many others, a clique of writers with whom Lovecraft corresponded. This group included Clark Ashton Smith, Robert E. Howard, Robert Bloch, Frank Belknap Long, and Henry Kuttner. Most of the elements of Lovecraft's Mythos were not a cross-pollination of the various story-cycles of the Lovecraft Circle, but were instead deliberately created by each writer to become part of the Mythos. 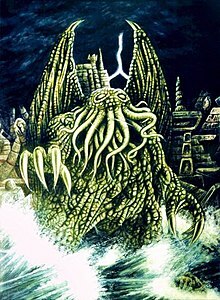 ... Lovecraft effectively connected Smith's creation to his story-cycle by placing Tsathoggua alongside such entities as Cthulhu, Yig, Shub-Niggurath, and Nug and Yeb in subterranean K'n-yan. Howard frequently corresponded with H. P. Lovecraft, and the two would sometimes insert references or elements of each others' settings in their works. Later editors reworked many of the original Conan stories by Howard; thus, diluting this connection. Nevertheless, many of Howard's unedited Conan stories are arguably part of the Cthulhu Mythos.— Excerpted from Cthulhu Mythos on Wikipedia, the free encyclopedia. The second stage began with August Derleth (The Derleth Mythos), who added to the mythos and developed the elemental system, associating the pantheon with the four elements of air, earth, fire, and water. Derleth combined Lovecraft's various cycles to create a large, singular story-cycle.— Excerpted from Cthulhu Mythos on Wikipedia, the free encyclopedia. This page was last edited on 31 August 2018, at 20:48.